Ms. Sharon is a trained instructor registered with the Suzuki Association of the Americas (SAA), and currently operates private studios in Sioux Falls, SD and Rochester, MN. She was most recently the Instrumental Ensembles Director at Schaeffer Academy in Rochester. Before relocating to the Upper Midwest, she was the Executive Artistic Director of the Indianapolis Suzuki Academy (ISA), where she also served as ISA’s Director & Instructor of Violin and Viola Programs and directed special programs such as Chamber Music, Performance Groups, and the Master Class Series. Prior to ISA, Ms. Sharon was the Founder & Owner of The Suzuki Academy of Southwest Colorado (formerly Rose Haven Suzuki Academy) and Kindermusik at The Suzuki Academy of Southwest Colorado, both in Durango, CO. During her tenure in Durango, she also served as the Director of the Preparatory Strings Orchestra of the Four Corners Youth Symphony Association, and the Academic Director of the Durango Chamber Music Academy. A lifelong musician who began Violin lessons at the age of 7, Ms. Sharon added the Viola to her musical life at the age of 12. She holds a Master of Music in Viola Performance from Rice University’s Shepherd School of Music in Houston, TX; a Bachelor of Music in Viola Performance from Oberlin Conservatory of Music in Oberlin, OH; and attended The High School for Performing and Visual Arts in Houston, TX. Her early training as a student, and later as a teacher, was with Suzuki Violin Teacher Judy Offman in Houston. She has registered SAA Violin/Viola Teacher Training Courses with Judy Offman (ECC, Violin Unit 1), Martha Shackford (Violin/Viola Units 2-3), Nancy Jackson (Violin Units 4-7, Suzuki Principles in Action, and Bowing Skills through Book 6), William Preucil, Sr. (Viola Unit 5-6), and Pat D’Ercole (Violin Long-Term Practicum). She is also in the process of attaining her SAA Certificate of Achievement (Level 1) and is working towards certification to become an SAA Teacher Trainer for Violin and Viola. Ms. Sharon has had over 26 years of experience teaching Violin and Viola in public schools, music centers, and privately in her home. Her teaching is centered on The Suzuki Philosophy, specializing in working with young children (age 4 and up). She incorporates scales, technique development, basic music theory & history, and ear/rhythm training into each child’s musical education, and more advanced students are challenged with advanced scales, etudes and repertoire. All teaching is tailored to each student’s individual strengths and learning style(s). Ms. Sharon has enjoyed extensive ensemble performing experience in different contexts and locations around the country and the world, including chamber music groups and orchestras in Massachusetts, Ohio, Texas, Oregon, Washington, Colorado and Southern Russia. 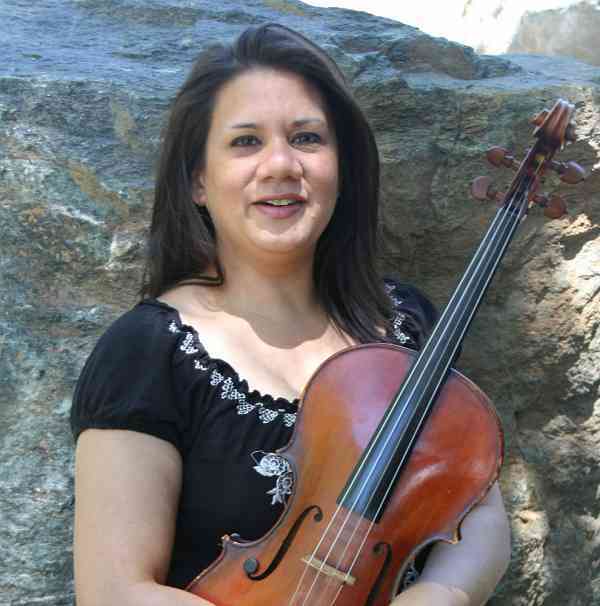 While living in Durango, she was the Principal Violist of the San Juan Symphony, and often collaborated with other area professional musicians to bring great chamber music to the Four Corners region as part of the Durango Bach Festival, the Durango Chamber Music Festival, and other musical events in the area. She was also given the honor of Principal Violist of the Colorado MahlerFest Orchestra in 2012. When she’s not teaching or performing, Ms. Sharon loves to garden, cook, and tackle household DIY projects. She is also an experienced breeder of gorgeous European and American Golden Retrievers, who love a good game of fetch and then coming inside for snuggles!